Florida Beach Bar asks beach bar visitors to vote for their favorite Florida beach bar. Find out who made the 2019 Top Florida Beach Bar list! Florida Beach Bar is pleased to announce the 2019 winners of its Best Florida Beach Bar competition sponsored by LandShark Lager. Many beach bar enthusiasts casted online for over 200 different bars. Votes were combined with Florida Beach Bar's Pink Flamingo rating to create the winning list. We are excited to announce that for 2019, Sharky's on the Pier in Venice was voted Best Florida Beach Bar for the second year in a row and the third time overall! Jimmy B’s Beach Bar, The Golden Lion Cafe, and Racing’s North Turn remain the only bars to make the list since the beginning of the competition! Caddy’s on the Beach in Treasure Island, Casino Beach Bar and Grille in Pensacola, Lemon Bar on Neptune Beach, Paradise Bar and Grill on Pensacola Beach and Juanas Pagodas in Navarre Beach are previous winners who are back on the list this year. New to the list this year is Oceanside Beach Bar and Grill in Flagler Beach. See the complete list below. There were a few Florida beach bars that were very close to making it in the Top 10. Flora-Bama Lounge and Package in Period Key, Tortugas Kitchen and Bar in Flagler Beach, Shephards Tiki Beach Bar in Clearwater Beach, Toasted Monkey Beach Bar and Sports Grill in St Pete Beach, and Bongos Beach Bar and Grille in St. Pete Beach received honorable mentions for a very strong showing! Thank you to all who voted and showed your favorite Florida beach bars how special they are! Special thanks to the Florida beach bar owners, managers, and staff who work hard every day to bring you a great Florida beach bar experience! Sharky's on the Pier previously won Best Florida Beach Bar in 2013, 2018 and they won the top spot again in 2019. They have made some great additions and changes to the bar in the last few years and now it's better than ever. Come see why Sharky's has been a Top 10 Award winner the past 7 years in a row. 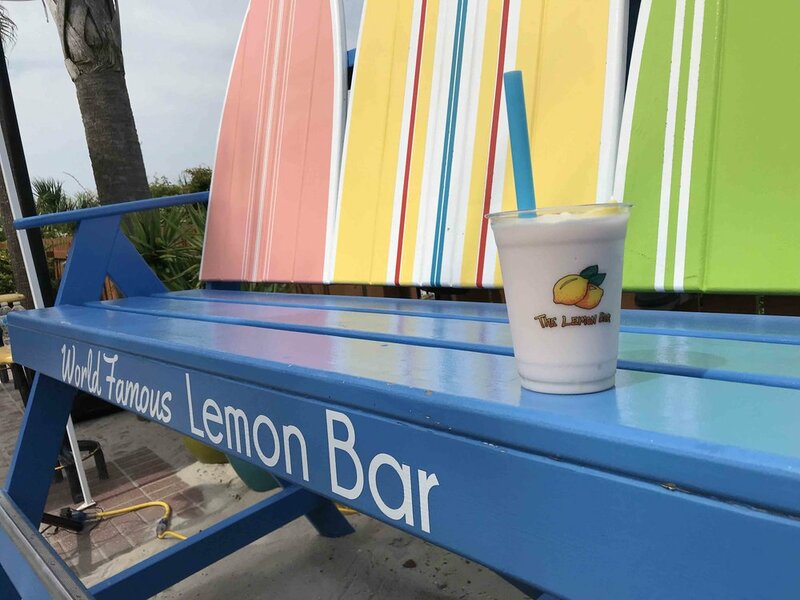 Lemon Bar is celebrating their third time on the Top Florida Beach Bar list! They moved up to second place in 2019 and are inching closer to that top spot! Jimmy B's Beach Bar on St. Pete Beach is a six time Best Florida Beach Bar and this year comes in as a Top Florida Beach Bar. Jimmy B's is one of only three Florida beach bars to make the Top 10 list since the beginning of the contest. Casino Beach Bar has made it to the Top 10 Florida Beach Bar list again for the third time in a row. Congratulations to the team- we can't wait to celebrate with them! The Golden Lion Cafe is a nine time Top 10 Florida Beach Bar winner, an honor held by only 2 other Florida beach bars. Whether it’s fireworks, jet fly overs, or confetti canons, they always know how to celebrate their win in style! Ponce Inlet's Racing's North Turn now ranks as one of only three beach bars that have made the Top 10 list for each year of the contest. Racing's North Turn sits at the exact location where Florida's racing history began. Caddy’s on the Beach is a 4 time Top 10 winner. It’s the kind of Florida beach bar you know you are going to love it the minute you arrive. Opening for breakfast early in the morning, you can literally spend all day here and many people do! Paradise Bar and Grill is back on the Top 10 Florida Beach Bar list! They have great views of the gulf, a lot of live music, and sand for your toes. 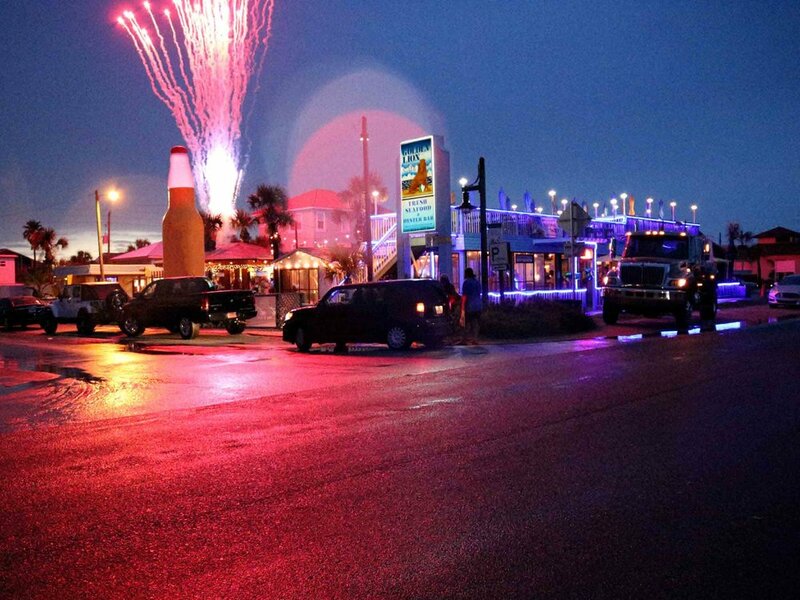 Juana's Pagodas in Navarre is on the Top 10 Florida Beach Bar list for 2019 and has made it in the top 10 the past three years in a row! 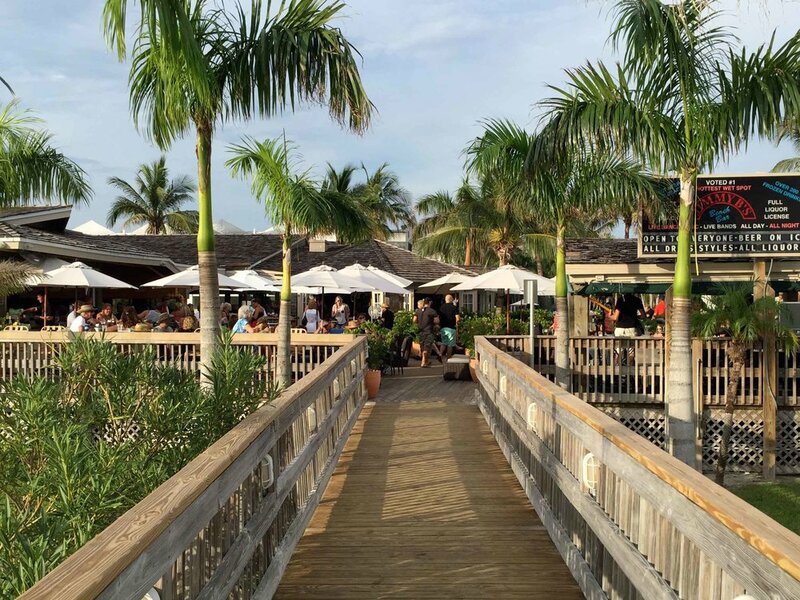 The great location, live music, and food and drinks all make this one of Florida's top beach bars! Oceanside Beach Bar and Grill is a new addition to our Top 10 for 2019! With live music and two levels of great views of the ocean, this is a must see on Florida's east coast! There are so many amazing beach bars in Florida that did not make it in the Top 10 list so be sure to pay them a visit, and if you like your experience, vote for them during the next Best Florida Beach Bar contest!